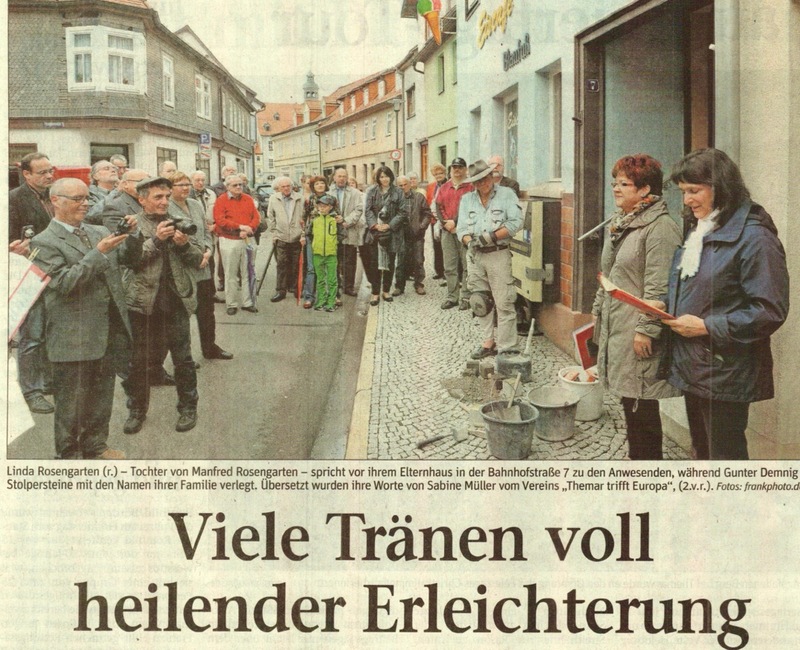 On 10 May 2013, four Stolpersteine were laid before Bahnhofstrasse 7. The Stolpersteine honour the Rosengarten family — Paul and Berta (née Schwab) Rosengarten and their two sons, Manfred and Erich — who lived in this house in the early 1920s. After the Nazis came to power in the 1930s, the Rosengartens left Themar, hoping to escape the increasing persecution of the Jews. 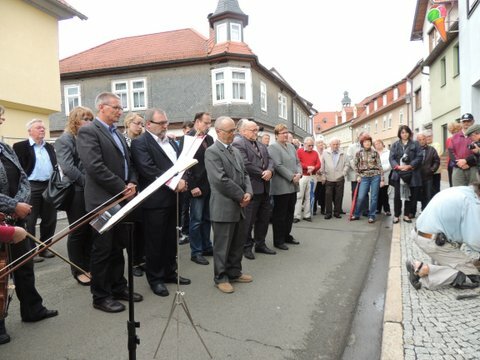 Linda Rosengarten, daughter of Manfred Rosengarten, spoke to the crowd that gathered in the Bahnhofstr. 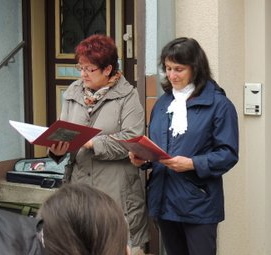 The Stolpersteine ceremony took place at 10 a.m. on 10 May 2013 and students, teachers, politicians, and many Themarens attended. “Thank you Burgermeister Böse, Sabine Müller and Themar trifft Europa. And, thank you Sharon Meen for bringing back to life the Jews of Themar. Let me offer a special thank you to Mrs. Iris Gleicke, the Böse family, the Morgenroth family, and individual members of Themar Trifft Europa for your generosity in funding the placement of these four Stolpersteine. Thank you, too, Gunter Demnig. You are a visionary. On Jom Hashoa, Jews recite names. Rememberance for us is a sacred duty. You repeat a sacred act, a sacred duty, with each Stolpersteine set. 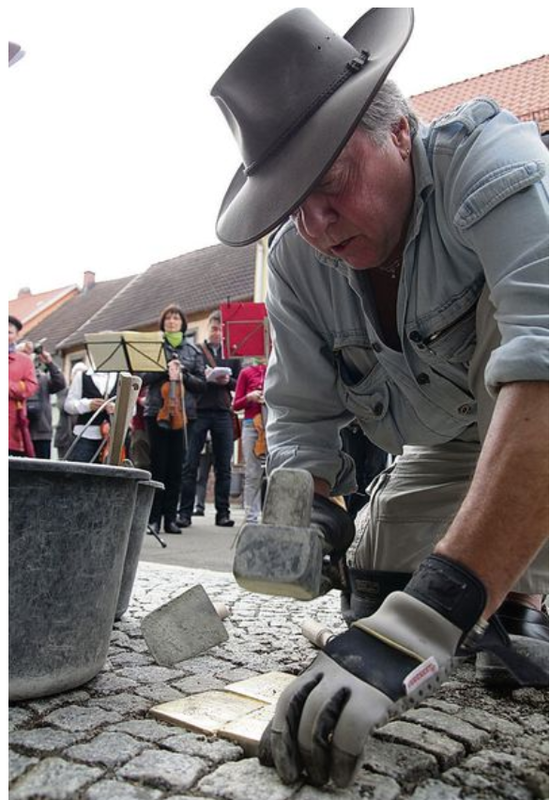 Mr. Demnig created Stolpersteine to remember the victims of National Socialism. Stones similar to these have been laid in over 800 places in Germany as well as in Austria, Hungary, the Netherlands, Belgium, the Czech Republic, Norway and the Ukraine. Through the recognition of one name, one residence at Bahnhofstrasse7, we are able to relate personally to my grandmother Bertha, my grandfather Paul, my uncle Erich and my father Manfred Rosengarten, each of whom walked this very street and stood on this very spot. And thank you citizens of Themar! We are here today with Poul and Arne Müller. Poul and Arne are Julius Müller’s children. Julius lived at Meinigenstrasse 5, not far from here. Julius’s aunt Frieda married Oskar Schwab, who was my great-uncle, my Grandmother Bertha’s brother. One thing we three have in common with you here in Themar is that we each are bound by generations to the same soil. Many of us here have family members buried in cemeteries nearby. Setting these Stolpersteine is an important part of acknowledging and making consistent the lessons of history. I am proud to be asked to participate and am proud that my father, Manfred, had so much to do with this effort. Thanks to Themar’s first observance of Yom Hashoa the day of Holocaust Rememberance on April 28, 2011 Poul, Arne and I met for the first time. Before that, I did not know that my cousins Poul and Arne existed! As you may already know some years ago Fritz Stubenrauch took the initiative to install a memorial that includes the Jews of Themar just outside the churchyard cemetery. 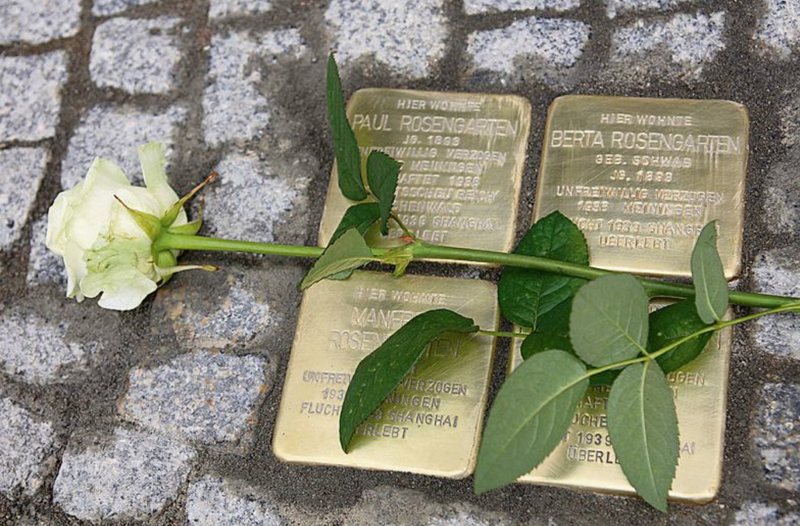 Together with that memorial, these four Stolpersteine remind us of individual people in Themar. But, they also remind us that among us here today are children of victims and children of perpetrators: all children of survivors of National Socialism. The scale and impact of this history means that our stories and identities were breathed into us before our very births, much of our own stories already told – eclipsing any story we could write for ourselves. We inherited our story in a unique way, not only the result of immigration or emigration, and certainly not only genealogy or family tree. We inherited something else, something more emotional, more dramatic: a history of genocide — and that is far beyond any one family, or even one person. Our very identities are dictated by the words victim and perpetrator. Neither word is flattering. Yet, even though, or perhaps because, our parents’ stories overshadow our very identities, we and our own children hold and are responsible for the past of our parents and grandparents in ways unique to the children of survivors. Not long ago, Jews were once considered ‘the other’ here in Europe. In some places and some hearts we still are. Once all is said and done, that brand ‘other’ is borne over generations. I know how hard that is to bear and I know how deep inside it hides. In the case of us here today, we remember for our parents and grandparents those memories we had nothing to do with. And, as descendants we each carry their trauma. We here today have trauma in common. Today, as we witness the installation of this memorial to four Themarans, being remembered is the one thing we act on. One stone. One person. Because of the power of Themar’s commitment, I will trust that the past will not be repeated here, partly because we recognize together that we share trauma. Yet, trauma is a shackle. Trauma is mean-spirited. It hurts. It hurts me. It hurts Poul and it hurts Arne. It hurts you, too. As we stand here today, we have an opportunity to come together as we seek to heal from our shared trauma. How can my trauma heal without your acknowledgement of the past? How can your trauma heal without my witnessing your steps to remember that my father was born, raised — in and fled this very town for his life? Today, here in Themar, I do not feel a victim. My identity has shifted; I am moving forward. I apologize if I cry. But my tears today are not bitter. My tears today are filled with a healing relief. At last, thanks to you and to Gunter Demnig, my tears are useful! I am moving forward and I hope you are, too. Clockmaker Saam owned the building at Bahnhofstrasse 7 when Manfred Rosengarten was born in the room above and to the left of the clock sign. Credit: City of Themar Archives. All of this began over 30 years ago, with one letter from my father to Themar. He was brave to write that first letter in 1983 to Mr. Saam, the clockmaker. It all began with an aspiration that that letter would be answered. For four years until November 1987, when Manfred died, letters were sent back and forth from Martinez, California where my parents lived to Themar and from Themar, Thüringen to Martinez, California. Indeed, reconciliation began in 1983. Even though Manfred was lucky to flee Germany with his stateless person documents, he continued to possess something that made better use of his guilt of survivorship and better use of the brilliant memory with which he was cursed, as well as blessed. What Dad possessed was a belief in the good to be found in human kind. Just as we see it here today. He possessed hope, even against those words of hopelessness spoken to his own children. In his letters to Themar, Dad used the words Homesick and Nostalgia. For all that my father and other Jews experienced, Manfred was gripped by homesickness for this little village of Themar. What is nostalgia if it is not hope? I believe one of Manfred’s hopes was indeed to be remembered by the people here and that Themar would acknowledge its past. 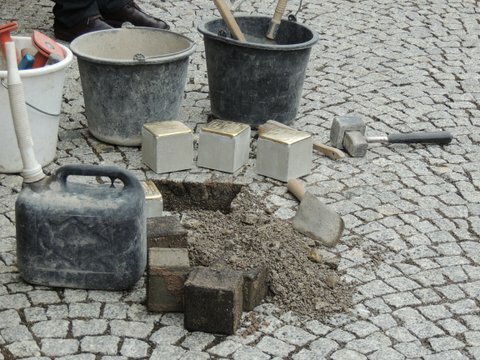 And here we are today doing just that by setting these Stolpersteine. Here we are today seeking to heal ourselves. Healing is the best way I know for both the children of perpetrators and children of victims to move forward. It is good to begin. Upon saying yes to coming here today, I admit I had mixed feelings. In truth I was as excited by the idea of travel to Europe as I was challenged by this event. It is my duty to be here, though, because I am Manfred Rosengarten’s daughter. His letters are an important part of Themar’s reconciliation project, which I respect and admire. July 1, 2013 in What's New. 27 January 2015 — 70 Years after the Liberation of Auschwitz! How did WWI affect Themar’s Jewish families?